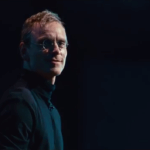 Universal Pictures have just released the first teaser of the Michael Fassbender-starring Steve Jobs biopic. If you haven’t yet seen it check it out below! The movie’s development has had its fair share of problems, but seems to have got itself well and truly back on track. David Fincher was originally set to direct for Sony, with Leonardo DiCaprio starring. Christian Bale then entered and exited the project. Such upheaval and change can spell disaster for some movies, but with Danny Boyle directing and Fassbender on board, as well as a script from Aaron Sorkin, this is clearly going to be a film worth watching – and an awards season contender. Fassbender may not look a lot like Jobs – unlike Ashton Kutcher who bore a striking resemblance to him in 2013’s television movie ‘Jobs’, but, put him in a black rollneck jumper and some blue jeans, and this trailer shows he’s more than capable of being believable as the man behind Apple. The trailer also shows us a glimpse of (and voiceovers from) Seth Rogen as Apple co-founder Steve Wozniak (in what appears to be very much a Jonah Hill-in-Moneyball type career-changing role), Kate Winslet as Joanna Hoffman, part of the Macintosh marketing team, and Jeff Daniels as John Sculley, the Apple CEO at the time of its sporadic rise, who clashed with Jobs. Steve Jobs is set for release in the UK on 13th November 2015.